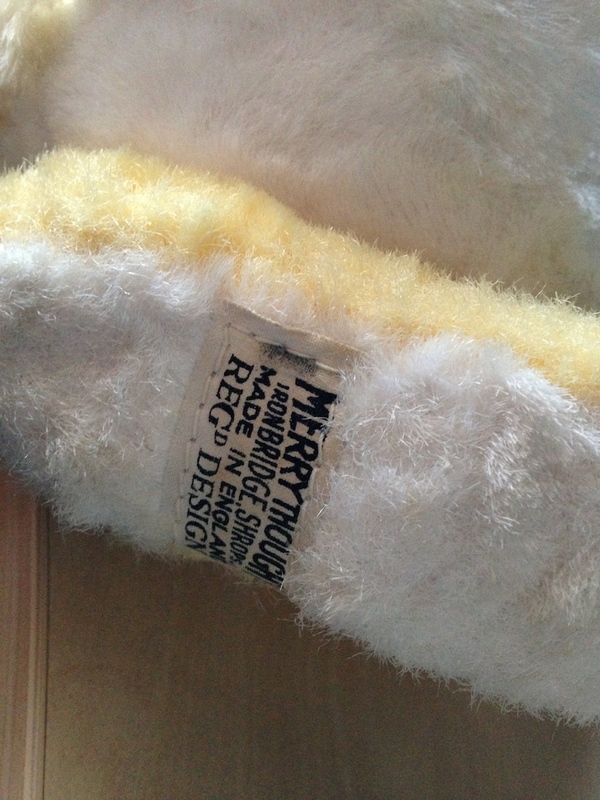 Hello there just wondering how to age a Merrythought toy. I have one here with a label circa 1957-1991, but is obviously 50’s-60’s. 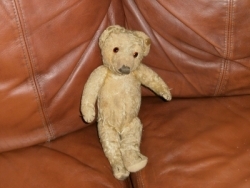 Can you point me in a direction where I might be able to sell this bear or at the least be able to find out more about him. Love your monkey! He is in great condition! He would have been made in the 1960s, with a mohair muzzle and mohair blends for his body. I’m assuming his eyes are glass. I will see if I can find out more info specifically about him and will email it to you soon. He would be valued at $80-$150 if sold at a Collectors’ Fair, but a little less on ebay. If you let me know where you live I can also give you the name of ‘collectables’ auctions etc where you could list him for sale. 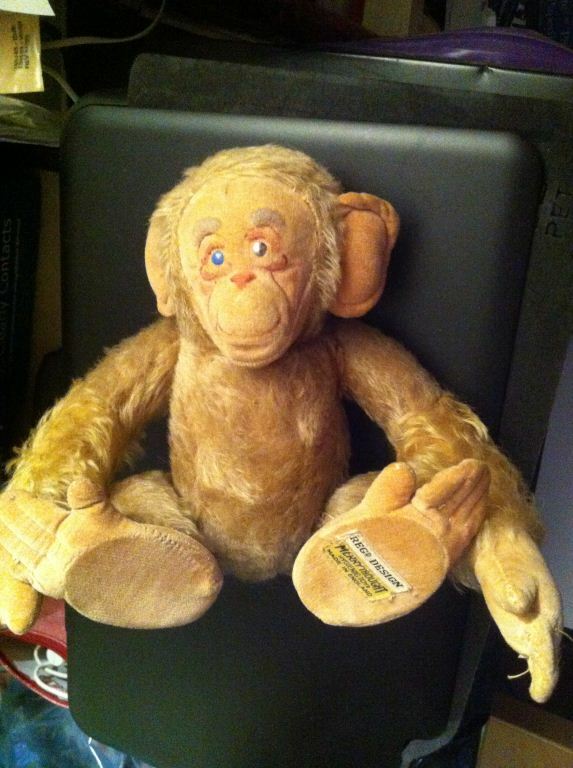 I have 2 of these monkey’s they are jointed and about 1 foot in length. I also have a leopard and some other stuffies they were from my mothers best friend they were hers as a child my mother is in her 70’s. I was wondering the value on them . Your monkey is wonderful, and in such excellent condition! He appears to be based on a character by the cartoonist, Clarence Lawson-Wood and would have been made in the 1930s-40s! Made from mohair, with felt hands and feet, and a pressed (moulded)felt face, he has been very well looked after. His label is that which was used from the mid 1930s-mid 1950s. At an Australian Collectors’ Fair he would sell for A$150-$200, though on the English market he may sell for a higher price. I have a Merry Thought Hygienic turtle that I bought for 10 pounds at a street market in England in 2000. The seller used to work at Merry Thought and said it dated from the 1930s or 1940s. I need an approximate value for insurance purposes. It is in great condition. I also tried to upload a photo–didn’t work. 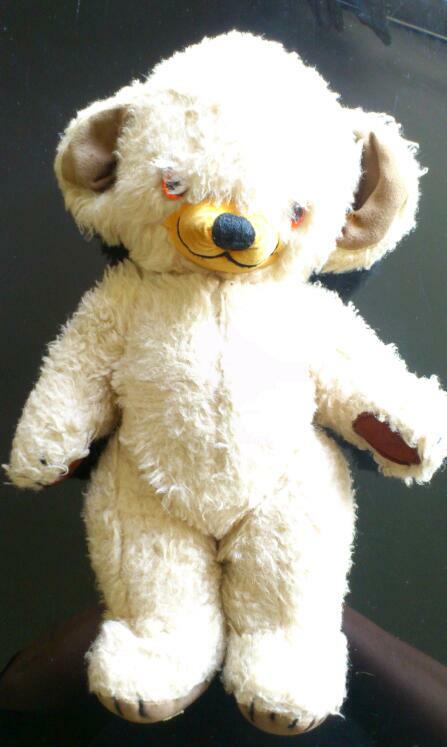 Hi, I’ve had this merrythought bear for about 13 years now and I was wanting to find out when he was made I think he’s a “cheeky” bear , im thinking he could be 1960’s , he’s in very good condition and im thinking about selling him . I didn’t buy him so I don’t know how much he was originally, he was handed down to me. He is 15″ tall , with the tiny hole on his ear, both ears have bells, and one of his eyes has got scratches, all his limbs move and his nose is velvet with a lovely smile. Hope I can ask you some info about Merrythought Disney. I have the book from Merrythought and it says there is a rabbit in the Pooh set, but I never saw a picture of it, so I have found a rabbit, which I think is the Pooh rabbit. 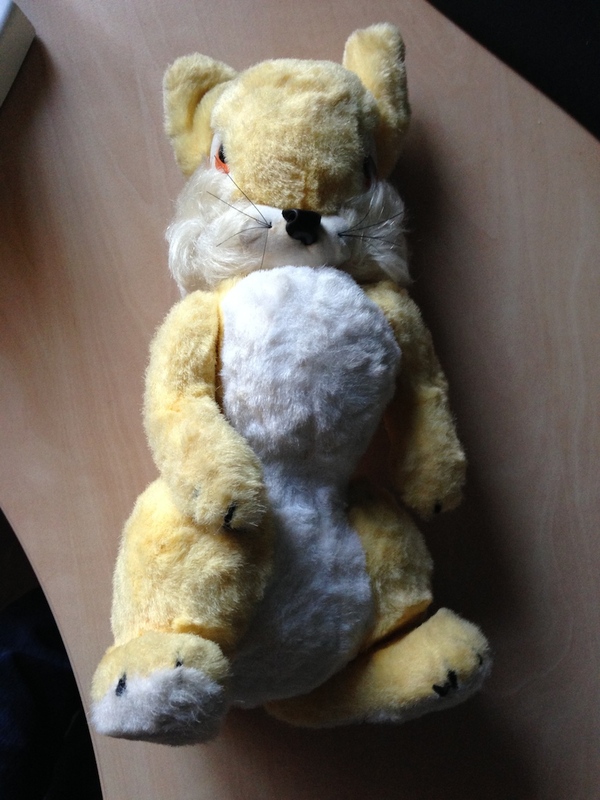 The rabbit looks a lot like the Thumper rabbit, but it is certainly yellow, the seller I got it from believed it was Thumper, but I believe it is rabbit from Pooh. Did you ever saw the Pooh rabbit and what do you think? I can upload a picture. 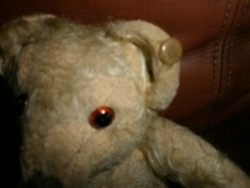 I have a Merrythought Teddy Bear with that tag on his foot and button in the ear. He is about 11″ tall with jointed arms and legs, stitched nose/mouth/claws. I believe he is from the 1930’s. The growler stopped working sometime in the 1950’s when I likely squeezed him too hard! 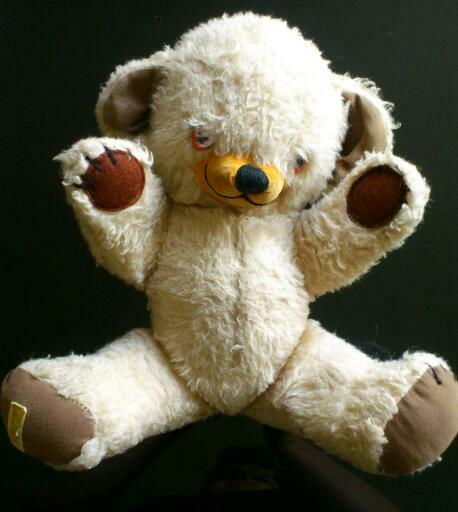 I am trying to get a value for this bear, as I have no family to pass him along to and wish to sell him now.